Van's parents recently sent us their Eames chair for our new condo. It was in Van's old room in their house, and wasn't used very often in this new space since it didn't match their new house decor. And because we love mid-century modern, they gave it to us! It was delivered last week, and we love it. Right now it is in our office, but when we move into a house- it will definitely be displayed more prominently in the living quarters. 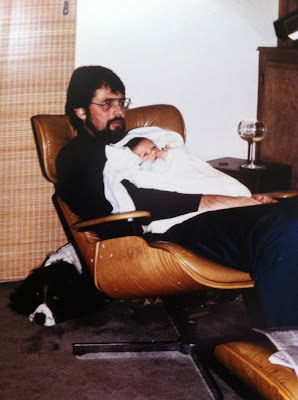 A bit of history through photos of the chair- below is Van's dad, Mark, holding baby Van in the chair, (with their old Springer, Paws in the background). I love my father in law's beard and mustache! Apparently this chair worked wonders for rocking babies to sleep. 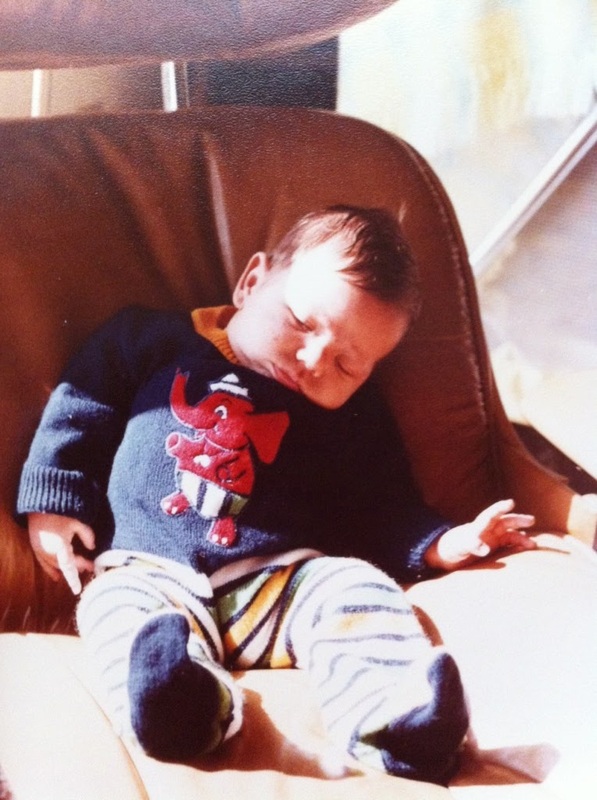 Another photo of Baby Van enjoying the chair at an early age. Passed out. Love this one. Finally-here is the chair now, definitely well loved and definitely in need of new upholstering- but completely classic. I'm in love, and feel so grateful that Van's parents gifted us with this beautiful piece of furniture. Thank you Shelley and Mark! Also, in this same shipment- they sent us one of Van's dads' paintings. We hung it over the fireplace in the living room- the colors are beautiful and really complement all of the light in the room. Wonderful! Glad you are enjoying the new additions to your home. A picture of Van rocking his son or daughter in the chair some day will be priceless! Now, it sounds as if I'm advertising them, but they have really good books for beginners, and you can read their more advanced stuff when you get better.